Get a great deal on a new laptop, 2-in-1 convertible or Chromebook. If you're after one of the cheapest Chromebooks around to try out saying goodbye to Windows, then this 11-inch model is worth a look. 4GB of RAM is enough for very basic work activities, although the 16GB of storage is a bit stingy. There is free access to 100GB of online storage though to make storing your files online super easy. If you need a basic, super cheap laptop that won't take up all the space in your bag when you're mobile, this is a real contender for a seriously low price. 4GB of RAM is enough to run basic tasks easily enough and the 64GB of storage will easily handle the Windows updates that the 32GB models struggle to cope with. Chromebooks like this are super cheap and a viable alternative to your standard Windows laptop, even more so if you're used to using Google's suite of office apps. This 11-inch one comes with a useful 4GB of RAM and 32GB of storage, which is surprisingly roomy without the bloated Windows OS. We'd opt for this one over the sometimes cheaper 16GB Chromebooks. Now £50 cheaper. If you're thinking you might find the keyboard or screen on the cheaper 11-inch Chromebooks a bit too small, then we've found a great laptop deal on a 14-inch version with 4GB of RAM and 32GB of flash storage (plus 100GB online). Save £70 today! This is more expensive than most of the other Chromebooks on this page, but it is a 2-in-1 laptop - which means it has a touchscreen and can be folding over to use like a tablet. You're also getting 4GB of RAM and an extended 64GB of storage. If you fancy a Chromebook but you're not bothered about the touchscreen and you don't need that much space for media files, then you could opt for one of the cheaper deals mentioned earlier. Like the idea of a speedy SSD instead of a regular mechanical hard drive but don't want to spend a lot of money? Well this may be the cheap laptop for you today. The V110 comes with a 128GB SSD, AMD A9 processor and 4GB of RAM. All in all, a very tidy machine for day-to-day work or uni activities. For a full-sized laptop this is one of the cheapest offers we've seen this week considering you're getting 4GB of RAM and a roomy 1TB hard drive. A handy machine for working through the basics away from the office or classroom. The stars are aligning this week for buyers tempted by the world of Chromebooks. Unlike some of the cheaper Chromebooks above, this one comes with 32GB of storage instead of 16GB and it's a 14-inch model rather than 11-inch. 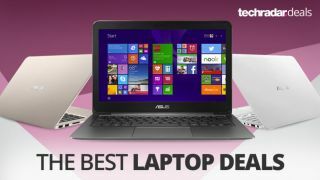 To sweeten the deal that little bit more, John Lewis has also thrown in a two year guarantee on this super cheap laptop. This 11.6-inch laptop deal is seriously tempting if you've been itching to try out the world of Chromebooks. It's a 2-in-1 convertible and comes with a very manageable 4GB of RAM and 64GB of storage. There are cheaper options available with similar spec, but they lack the build quality and eye-pleasing nature of this lovely Lenovo. Also comes with a two year guarantee. Any laptop deal with 8GB of RAM for under £300 is worth as second look. This one gets even better the longer you look too with a 1TB hard drive and a 15.6-inch HD screen. For standard day-to-day activities this will be plenty for most users and that 8GB RAM means you can multitask or run lots of tabs at once without any issues. This is a fantastic price for a full-sized laptop with 8GB of RAM, allowing you to multitask away with an abundance of tabs, apps and programs running at once. This is a great price for a laptop loaded with a 256GB SSD too. If you're going to be spending significant amounts of time at a desk working with a laptop, this is a solid performer. ebuyer has knocked £30 off this laptop deal, but even without the discount, the spec inside this laptop is a real head turner at this price. A 256GB SSD paired with 8GB of RAM means this will handle multiple tasks at once with ease. An AMD Ryzen processor and Redeon Vega 3 graphics card will allow for some very light gaming too. This decent Acer laptop has a 7th gen Core i5 processor and 1TB hard drive. It only has 4GB of RAM, though, but that's plenty for basic multitasking and the processor should pick up the slack. Large SSD drives are fantastic for increased performance and faster loading times, but they can really drive up the price of a laptop. Which is why we're surprised to see this laptop deal weighing in way under £500 with a 256GB SSD, 8GB of RAM and an i5 processor. A powerhouse on a budget for sure. There's something about these blue and gold laptops that always catch our eye. This Acer model's allure goes beyond skin deep affections though with an 8th-gen i5 processor, 8GB of RAM and a 256GB SSD. It's super portable too with a smaller 14-inch screen which makes carrying it around a fair bit easier than your standard 15.6-inch laptop, whilst maintaining a decent keyboard size. Currys has knocked £200 off today too! Also available in 'Honey Gold' with a two year warranty for £699.95 at John Lewis. That's a big saving considering convertible laptop/tablet hybrids with high-end spec don't come down much at this time of year. The ever popular model packs an i5 processor, 8GB of RAM and a large 256GB SDD. Very: Often surprises with cheap prices on electronics.